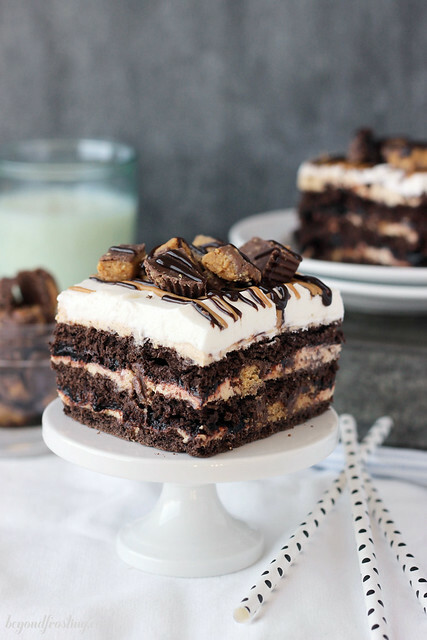 This dreamy Chocolate Peanut Butter Cup Lasagna is loaded with Reese’s Peanut Butter Cups and packed with layers of chocolate and peanut butter cheesecake. Would you believe me if I told you I made this recipe last year and I’ve been holding it hostage until just the right time? The time is now. This week I’ve got three recipes that are all peanut butter and chocolate. 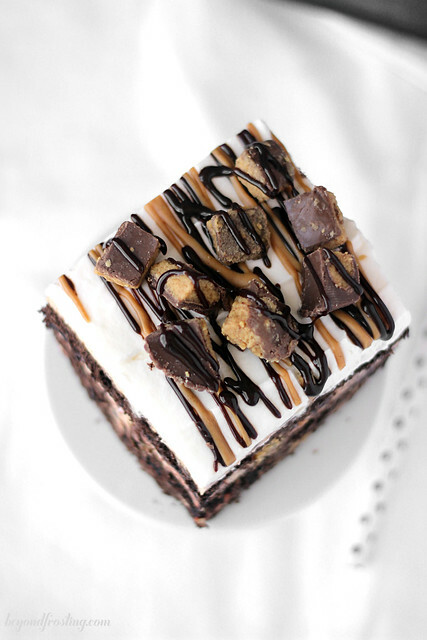 Since it is peanut butter and chocolate week here on Beyond Frosting, I thought we would just get right to the point. 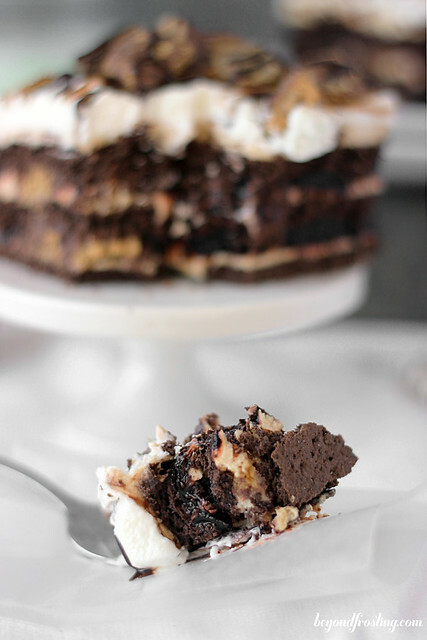 This Peanut Butter Chocolate Lasagna is a layered icebox cake. You are going to have to tell me which layer is your favorite. Is it the chocolate graham crackers? The chocolate pudding? 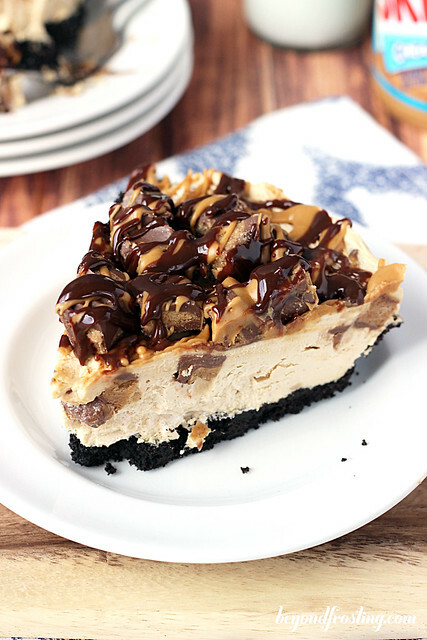 The peanut butter cheesecake? Or is it the peanut butter cups? 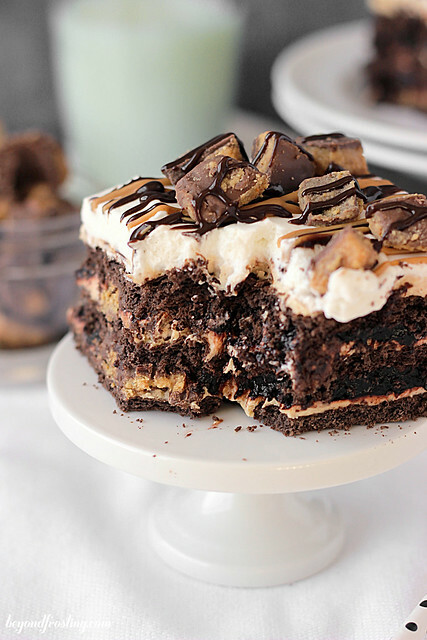 Perhaps the topping is the best part- Cool Whip, Peanut Butter Cups and a drizzle of chocolate and more peanut butter. Did I mention this dessert has peanut butter? 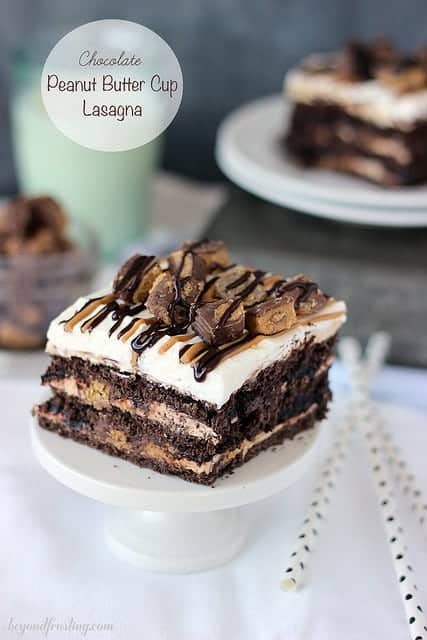 Dessert lasagnas are basically a no-bake dessert that is pre-assembled and refrigerated until served. I just so happen to love them most when there are layers and layers of the good stuff. For this recipe you need your “noodles” which can be regular or chocolate graham crackers. Sometimes I have a hard time finding the chocolate ones. 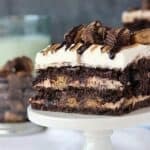 For this recipe, there are three layers of graham crackers, so you will need about a box and a half of graham crackers. There is a little bit of prep involved before you can assemble the dessert, but it’s easy, so stick with me. You need to plan ahead and thaw your Cool Whip. I am horrible at this part. Usually I decide on an idea last minute and I get all excited, then realize I have to thaw a Cool Whip. Talk about a buzz kill. Sometimes I will assemble the lasagna and then add the Cool Whip once it has thawed. You also need to make some instant pudding and let it set for 10 minutes or so. What did we do before the times of instant pudding? I couldn’t tell you because I’m quite sure I wasn’t alive back then. I think the lasagnas are so pretty because you can see how many layers you have! If you allow the time for the ingredients to set, the graham crackers will soften so they are very easy to cut through and you can serve up a beautiful slice that will surely impress your friends! 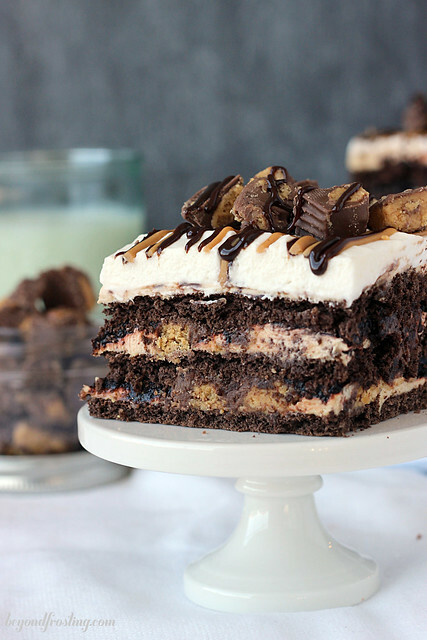 This Chocolate Peanut Butter Cup Lasagna is loaded with Reese’s Peanut Butter Cups and packed with layers of chocolate and peanut butter cheesecake. In a medium sized bowl, combine chocolate pudding and milk, whisking until pudding mix is dissolved. Refrigerate 5-10 minutes until pudding is firm. Add peanut butter and beat into cream cheese. Lastly, add heavy whipping cream and vanilla extract to cream cheese mixture. Start at a low speed until the heavy cream is incorporated and then increase speed to medium high. Whip for 2-3 minutes until smooth. Chop Reese’s Peanut Butter Cups into small pieces. To build the lasagna, lay a piece of parchment paper on the bottom of a 9-inch by 13-inch pan. Lay out the chocolate graham crackers to cover the bottom of the pan. For one edge, you will need to break the graham crackers apart. Use an offset spatula and spread a layer of the peanut butter mixture over the graham crackers. You will need to use your fingers to hold the crackers together until you get this layer down. Finish the layer by spreading half the chocolate pudding on top. Spread evenly. Sprinkle with peanut butter cups and gently press into the pudding layer. 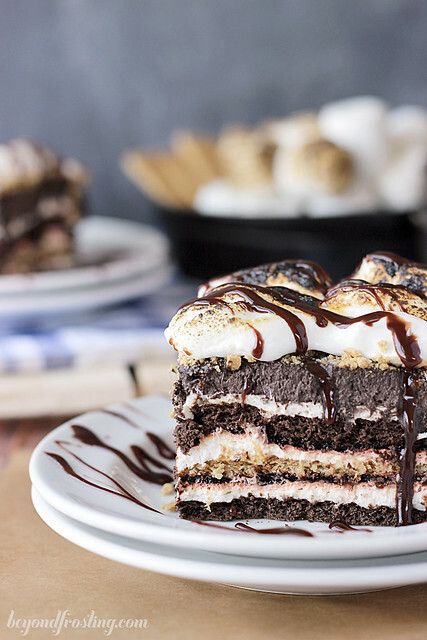 Continue to build the next layer with graham crackers. Spread another layer of peanut butter sauce followed by remaining chocolate pudding. Sprinkle with Reese’s peanut butter cups pieces and gently press into the pudding mix. Finish it off with the top layer of chocolate graham crackers. Spread Cool Whip on top of the graham crackers. 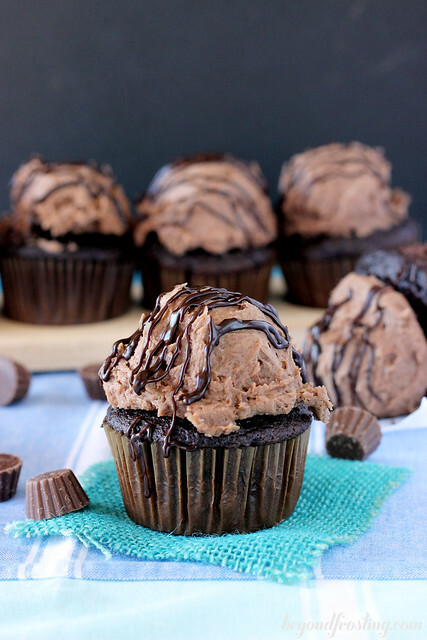 Sprinkle the top with remaining Reese’s Peanut Butter Cup pieces. Now time for the Drizzle. Heat a jar of hot fudge sauce for 30-60 seconds into the microwave until smooth. Drizzle sauce over the top of the Cool Whip. For the peanut butter, put in a microwave-safe dish. Microwave for 30-45 seconds. Drizzle over the Cool Whip. Refrigerate for at least 2 hours before serving. Cake must stay refrigerated and can be prepared a day in advance. One thing that can be helpful to drizzle the hot fudge and peanut butter sauce is to pour it in a piping bag or Ziploc bag, and just cut the tip off. I suggest to refrigerate this recipe for at least 2 hours before serving to allow the ingredients to set and flavors to merge together. I think so, it just might be a little thicker and hard to slice but it sounds yummy to me! I have a question, I hope I haven’t missed the answer in the post somewhere (I did double check…not that it means anything lol) What size pan do you suggest using for this recipe? never mind, I just read it in the comments–I’m sorry 🙁 9×13 !! No worries! I’ve added it into the recipe notes. Thank you! Hi, I want to make this recipe this weekend! Can you tell me what size pan you used?